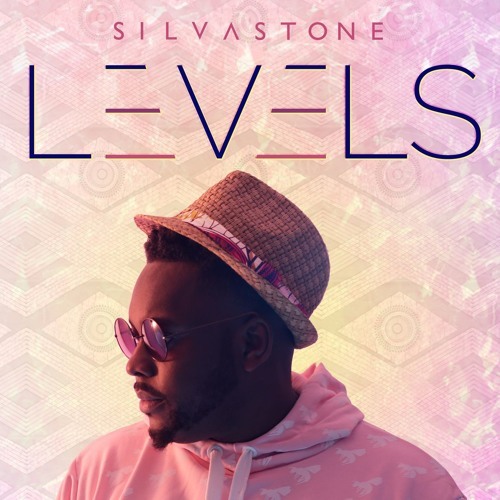 SILVASTONE is a fast-rising London-based African artist/producer renowned in the UK music scene and has an equally extensive international recording and performing profile. He was heavily tipped by BBC Radio 1Xtra amongst their list of “Hot For 2015” – the new artists to keenly watch in 2015 and beyond. He went on to be nominated as “Best African Act 2015” in 3 separate popular UK awards – MOBO, UMA and BEFFTA, in recognition of his high work ethic, quality content and live performances. 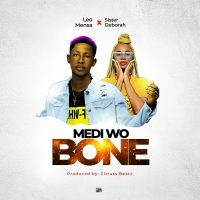 In addition he was nominated for 4 Awards in the prestigious Sierra Leone 232 Entertainment Awards including Best Male Act and Best Album/EP which he was awarded. 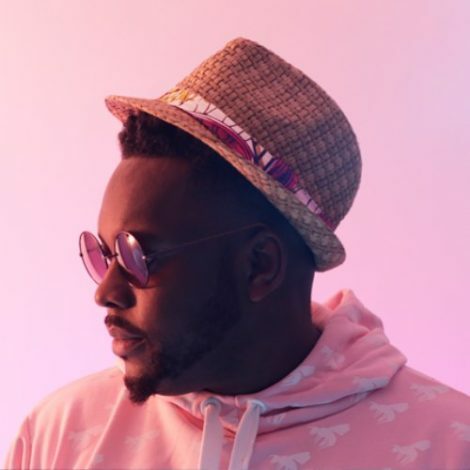 Generally referred to as an Afrobeats artist SILVASTONE’s music is best described as a creative hybrid of African beats, UK sounds and Global melodies. He is presently preparing the release of his much-anticipated second EP, #LEVELS – due late-January 2017, which he promises to be another game-changing project that builds on his debut, TRANSITIONS. Other 2017 plans include his biggest headline concert (April) and returning to Austin, Texas for his second official booking at the world famous SXSW Music Festival. Rewinding back… Silvastone had initially gotten into the game officially as a producer/songwriter composing songs for several big African acts and travelling as a tour DJ and musician for these artists. It wasn’t until late 2014 when he officially started his artistry endeavours after releasing the excellent self-produced and self-written ‘TRANSITIONS’ EP. It was received with great acclaim and garnered immediate support from influential and notable tastemakers across the board like Mistajam, DJ Edu, Ras Kwame, Shortee Blitz, Zane Lowe, Charlie Sloth, E-Plus, Tim Westwood, DJ Target, DJ Neptizzle, etc. His music is on regular rotation on numerous radio and TV networks worldwide and especially Africa – Nigeria, Kenya, Uganda, Ghana, Sierra Leone, South Africa, Gambia, Tanzania being examples of where he has repeatedly undertaken radio interviews over the last 12 months. SILVASTONE composed music featured in Hollywood blockbuster “The Good Lie” (starring Academy winner Reese Witherspoon). 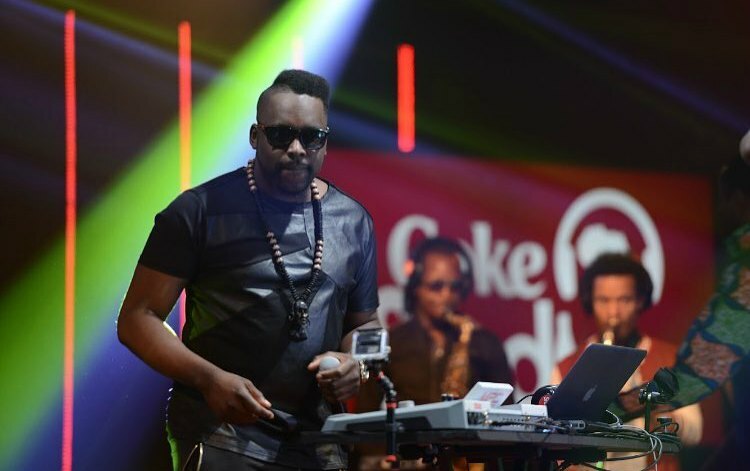 He has featured on various TV shows including series 2 and 3 of a popular pan-African reality music TV show called CokeStudioAFRICA alongside some of the continent’s biggest stars and broadcasting prime-time across Africa every weekend and online to the world. In addition SILVASTONE hosts a monthly African Music show on Emirates Air in-flight entertainment channel. Born in London to Sierra Leonean and Ghanaian parentage, Silvastone developed a keen interest in playing music instruments whilst at a very young age and could effortlessly play piano by age 5. Influenced initially by his parents love of Ghana Highlife and Classical music and later other genres his older DJ brothers played he started to create his own music when he moved to study and live in Freetown (Sierra Leone) with his father at the age of 11. Years later he would be showcasing this natural talent on the world stage. 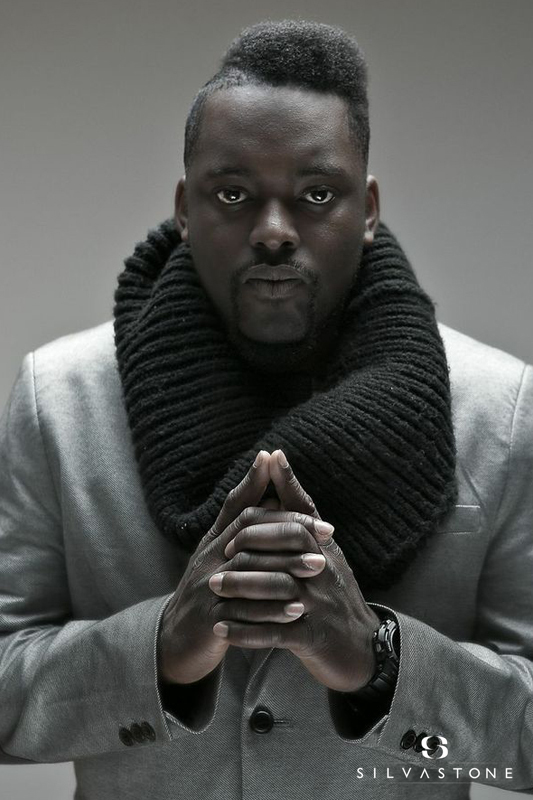 He has since produced/remixed and/or collaborated with an diverse array of the hottest new talent from across Africa and the worldwide including Ace Hood, Sarkodie, Sneakbo, Rita Ora, Davido, Damian Marley, Mark Morrison, Afrojack, Don Jazzy, Chidinma, Estelle, D’banj, Dan Croll, Emmanuel Jal, Blak Twang, Atumpan, 2Face, Banky W, Wanlov, Wayne Marshall, etc. Having initially produced for many such artists Silvastone decided in 2014 to concentrate on developing himself as a full fledged vocal artist leading to his aptly entitled ‘Transitions’ project later that year. It’s breakthrough and heavily playlisted single “Loving My Baby (Remix)” featured Nigerian Afro-pop sensation Yemi Alade and its follow-up “Skatta (Remix)” features legendary Jamaican global dancehall stars, Chaka Demus and Pliers. 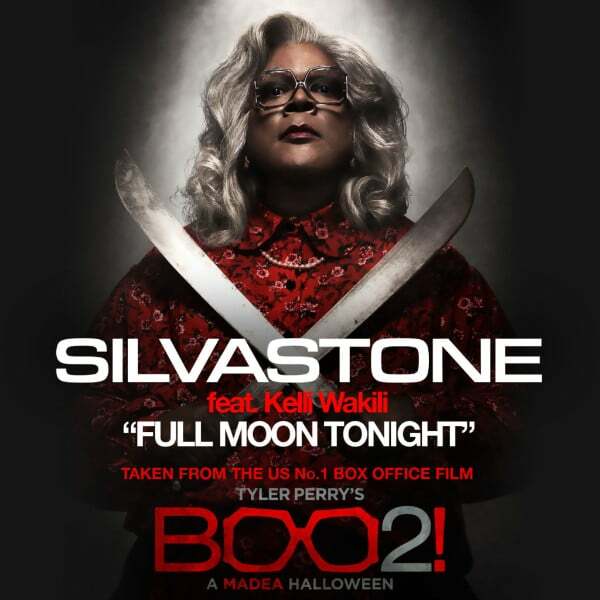 Silvastone is now a seasoned performer who is beloved for his charismatic energetic performances. He featured on the line-up of the 2 biggest Afrobeats concert in 2015 – Dance Afrique and Dance Afrique Summer Fest, both held at London’s iconic Wembley SSE Arena and collectively included by Akon, Mafikizolo, P-Square, Flavour, Shatta Wale,Awilo Longomba, Yemi Alade, etc. Earlier in the year he’d toured around the UK on the Soul Acoustic Tour. 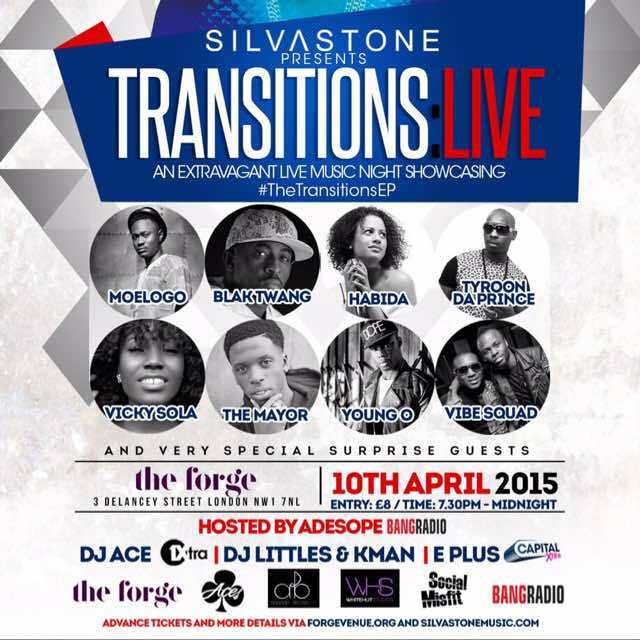 In late 2014 he headlined his own gig to full house at London’s prestigious Ronnie Scotts to launch his debut EP and followed this up with a fabulous ‘Silvastone presents “TRANSITIONS:LIVE” alongside his excellent band and very special guests at The Forge, Camden Easter 2015. 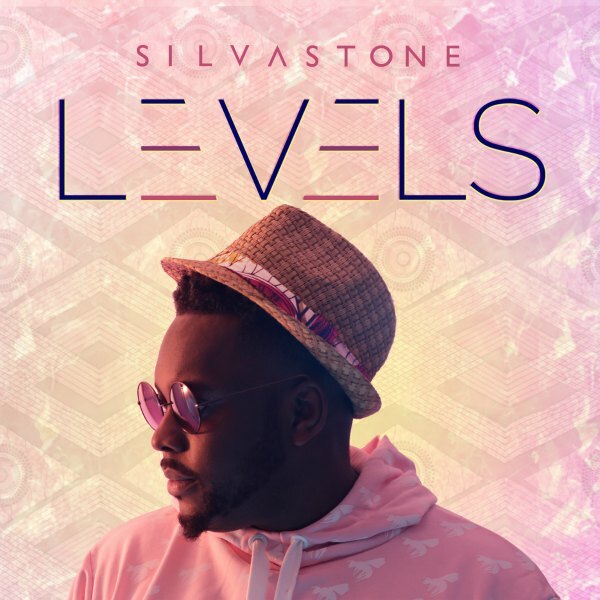 SILVASTONE featured on the line-up of nearly every major Afrobeats event in the UK in 2015 and was booked on several UK festivals last summer including the world famous Glastonbury Festival where he performed twice over two days. Throughout the year he also performed at numerous events and festivals across the world including concerts in Sweden, Kenya, Nigeria, Zimbabwe, etc. The popular performer was also an opening act on Davido‘s 2015 UK tour and was official support act for Fuse ODG on his TINA UK national arena tour in November. 2016 proved to be another sentinel year for SILVASTONE. He was booked for SXSWFestival in Austin, Texas USA in March where he performed at 3 official showcases amongst some of the hottest artists worldwide. Prior to that he had kickstarted the year supporting The Compozers at their sold-out headline gig at O2 Forum, London. Further performances followed at Manchester University, both enCORE Concert’s at London’s O2 Islington Academy, Ghana Party In The Park, Oxjam Music Festival, etc all featured in his busy diary. In addition he supported Cadet at his September headline concert (alongside Krept&Konan, Eugy, AJ Tracey, etc) and Moelogo at his ‘Ireti Unplugged’ concert at North London’s venue Birthdays. His international travels extended to Atlanta where he performed at official showcases at A3C Festival in October and more recently undertook a promotion campaign in Ghana where he is poised to return later in the year. The multi-talented SILVASTONE has also recently been subject to increasing label and publisher interest. Meantime many favoured artists continue to request collaborations and productions with him whilst promoters seek bookings with this outstandingly gifted young talent. On the music front for 2016 he kicked off the year with two simultaneously A-List playlisted single’s “My Place” (featuring Sneakbo) and “Pressure” – starring US rap artist Ace Hood and Manchester grime rapper Bugzy Malone that was the lead single on Charlie Sloth’s ‘Hood Heat 2’ album released on Virgin/EMI Records. In anticipation of his sophomore project SILVASTONE is promoted several bridging singles including “It’s All Love (Salone Love)” – an ode to his beloved Sierra Leone heritage, and “Real Man” – featuring artist/director Gory, both which are got great support from all the aforementioned music curators. The #LEVELS EP extends his journey beyond 2017 to firmly cement and build his place as an elite artist/producer on the fast-moving Afrobeats/Afropop space. Expect a selection of strong songs that continue on his signature blend of popular musical genres expertly and infectiously interwoven into an African backdrop. First single off the project, the R&B tinged “Remedy”, illustrated this neatly and in return received widespread support on radio, TV, clubs and online. It’s follow-up, the aptly titled and bass-throbbing “Incredible” is already receiving early support and playlisting. Stay tuned for more details about the release of this much-anticipated forthcoming project. Watch this space!